Its been about three months since the Woodstock Luthiers Invitational. I had a great time exhibiting my guitars there. I was well greeted by all the attendees and the other exhibitors and luthiers. It was a great event and I formed many new alliances. Many musicians stopped by to ask questions and play my instruments.. I was fortunate to have Kinloch Nelson stop by and play one of my guitars. Kinloch is an amazing and talented musician who has a unique open tuning style that is all his own. Kinloch Nelson is a true master of the acoustic guitar. www.kinlochnelson.com. Kinloch, it was a pleasure to listen to you and have you play my guitar. Mr. John Monteleone stopped to chat for a moment. A thrill to pose in the photo with him. Monteleone’s work represents the finest in arch top guitar design and construction in the 20th century. His work embodies the marriage of traditional and contemporary arch top guitar design and stands as a benchmark for his craft. His work has been exhibited in the metropolitan Museum of Art’s “Guitar Heroes” exhibition in 2012 and his instruments are highly prized and desired by jazz musicians worldwide. http://www.monteleone.net. Thank you for the time John. JR Rogers, creator of Acoustic Guitar Forum testing out a Jay Rosenblatt Guitar. The show itself was packed with attendees and exhibitors. It was probably the busiest to date. Luthiers Invitational Main floor. Photo © Jay Rosenblatt. A project I started in late 2014 is in its final stages. This Cutaway model made of Honduran Mahogany with an Alaskan Sitka Top is ready to go to the finisher. Many steps along the way to makes this baby come to life. Here are a few photos of the work. I am very pleased with how this turned out as it represents many fine details of my woodworking and guitar building ability. Each instrument I make is a lesson in patience and each one progressively teaches me more about this craft. Test fitting ot tuning machines. Gotoh 510s in cosmo black. Maple burl backplate with Gotoh tuners. Jay Rosenblatt Guitars. This guitar features; Honduran back and sides, Alaskan sitka soundboard, Quilted maple binding with rope purfling, a Macassar ebony fingerboard, ebony bridge, cocobolo head plate with maple binding, a maple burl backplate, arrowhead fingerboard markers with MOP side dots, bone nut and saddle and will have a lacquer finish applied. Thanks for reading and keep playing your guitar. For information on how to contact me go to the “about page”. 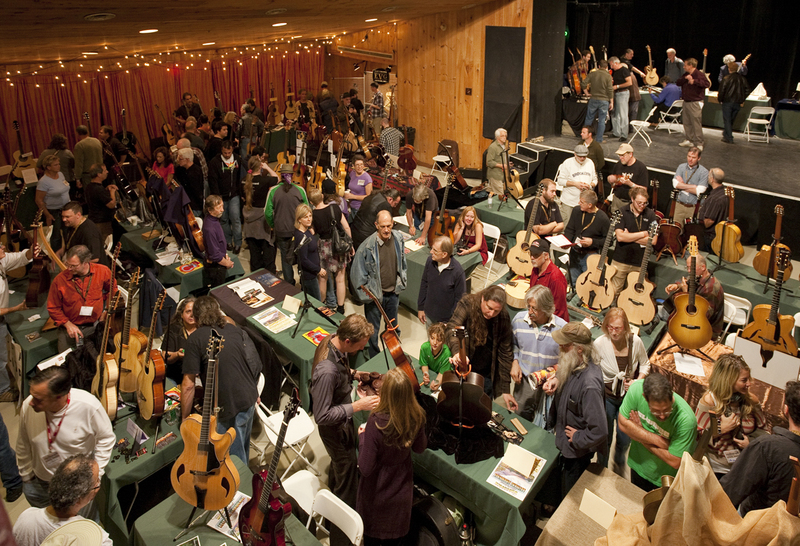 Previous Post In the luthiers workshop, The Woodstock Luthiers Invitational and acoustic music.